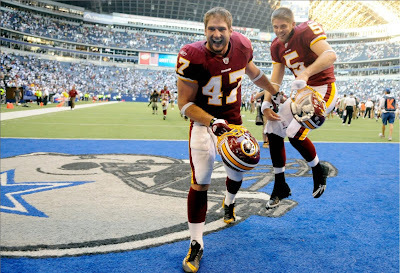 Kailua Mom pointed out that Washington Redskins tight end Chris Cooley posted a newspaper photo of himself and Colt Brennan celebrating the Redskins win over the Cowboys on his blog. This Washington Times article has a color version of the photo (need to click to picture 2 of 2). Not really any news, but good to see Colt having fun. UPDATE: Here's another photo posted by "Slaphands69" (hmmm) at SportsHawaii.com. Good stuff. I hope that bond develops. Nothing better than having a connection with TE as the bail out option. Also, WA showed it has the stuff to be a contender. Just wait a few years when Colt develops and has his shot. It's going to be electric.